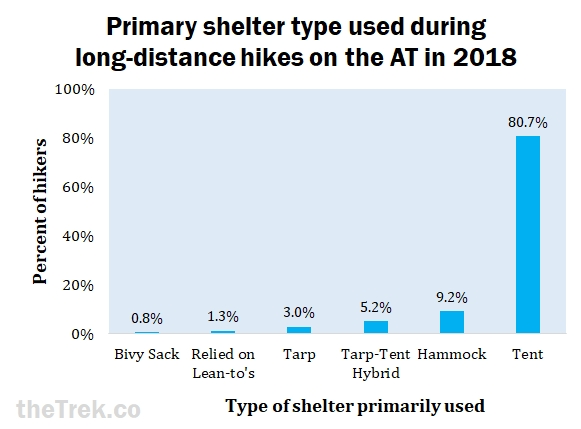 Each year, The Trek surveys long-distance hikers on the Appalachian Trail (AT) regarding the shelter systems they use, such as tents and hammocks. 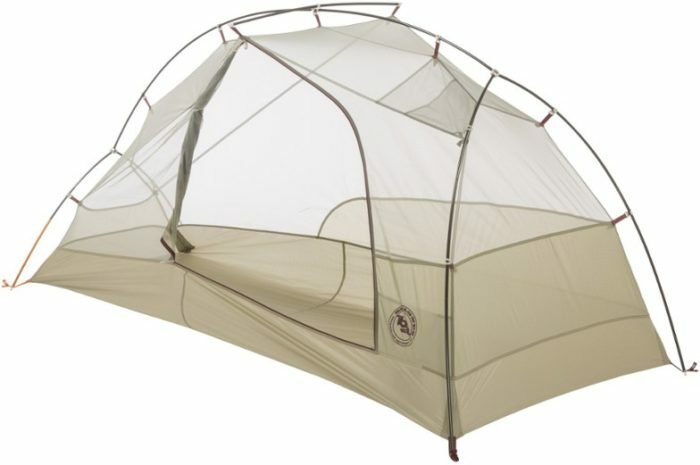 In this post we cover the types of shelters used, tent use with significant others and dogs, tarp sizes for hammocks and tarps alone, and the top brands and models of shelter systems. For the details, keep reading, or skip to the TL;DR at the end. 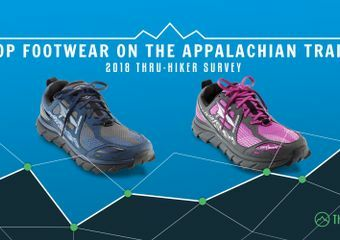 Three hundred and ten hikers participated in the survey, all of whom had walked a section or thru-hike of the AT in 2018. Three quarters (75.9 percent) were thru-hikers and the rest were section hikers. For more details on the hiker demographics, check out our post with general information from the survey. Per usual, the majority of hikers used tents, while about a tenth of hikers used hammocks. All other forms of shelters were only rarely used. Almost all (97 percent) of the people who hiked with a significant other predominantly used tents. (Keep in mind that more than one person from a couple might have completed the survey, which could skew the results a little.) Everyone (100 percent) who hiked with a dog used a tent. About 80 percent of people who hiked without a significant other OR a dog primarily used a tent. The other 20 percent used the other forms of shelters listed above. 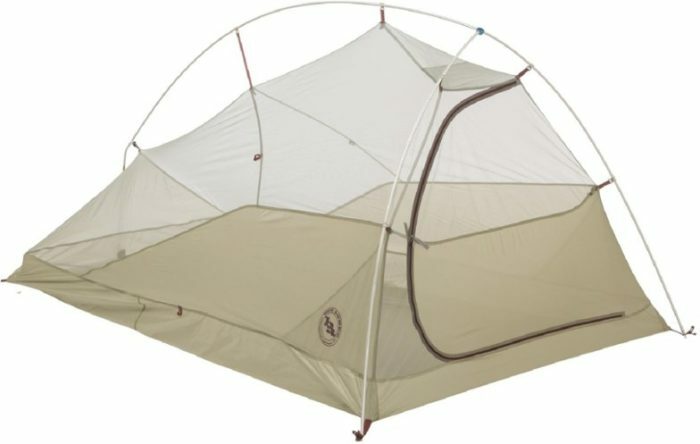 While solo hikers often use two-person tents to have a little more room, the size of tent needed depends on how many people and dogs are using it. 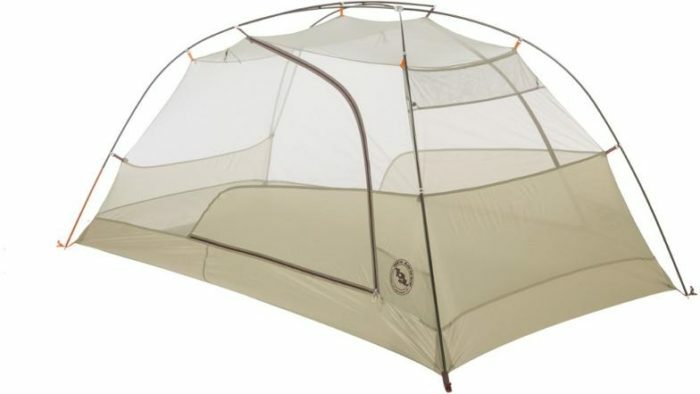 For this reason, I looked at tent size by hiking partners. Keep in mind that some people hiked with friends or family, and they were lumped with the solo hikers because it wasn’t clear whether they shared a tent. Furthermore, very few hikers brought a dog for the majority of the hike, so these numbers are based on limited data from only six hikers. 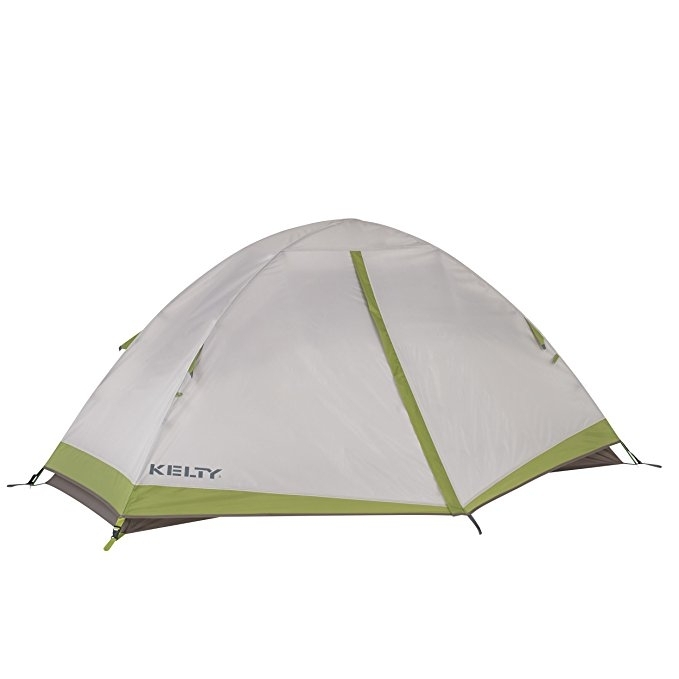 About half of solo tenters used a two-person tent, and less than half used a one-person tent, while it was rare for them to use a three-person tent. 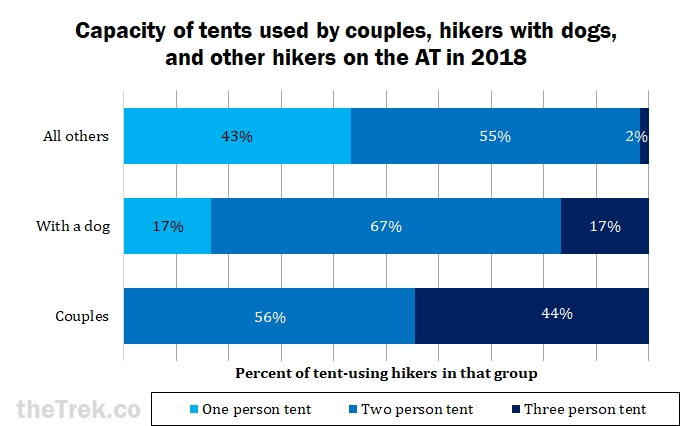 In contrast, hikers who went with a significant other most of the way used two-person tents about as much as solo hikers, but a little less than half used a three-person tent, while one-person tents were uncommon for these hikers. 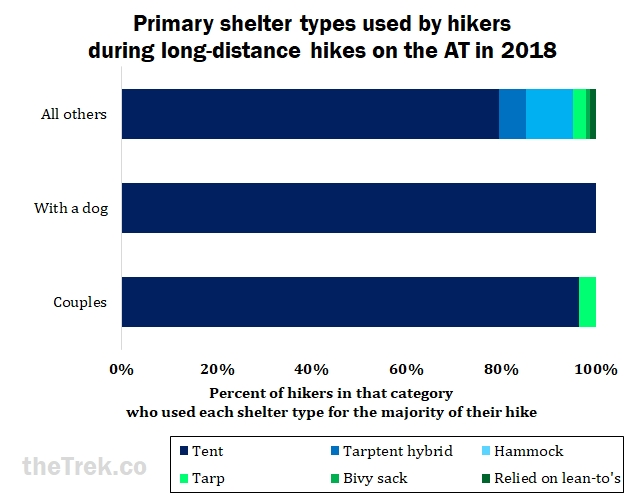 Although our data on hikers with dogs is limited, it does appear that two- and three-person tents are the way to go if you plan to hike with a dog the majority of the way. 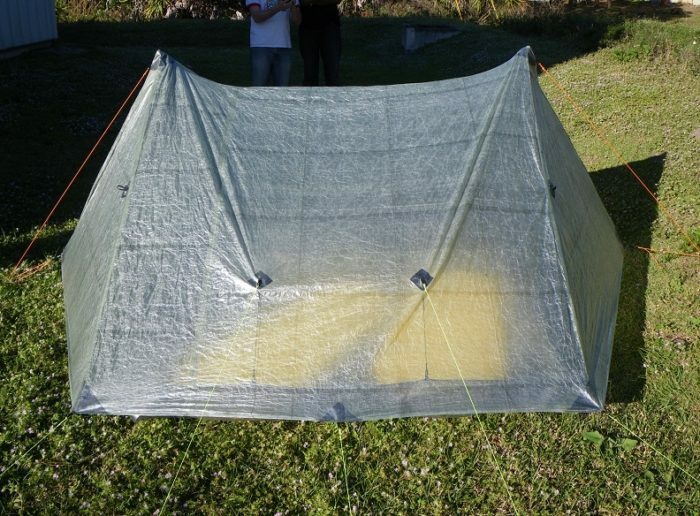 For hikers using hammocks, the tarp they used as a rain fly was most often about 10 feet by 12 feet in size. 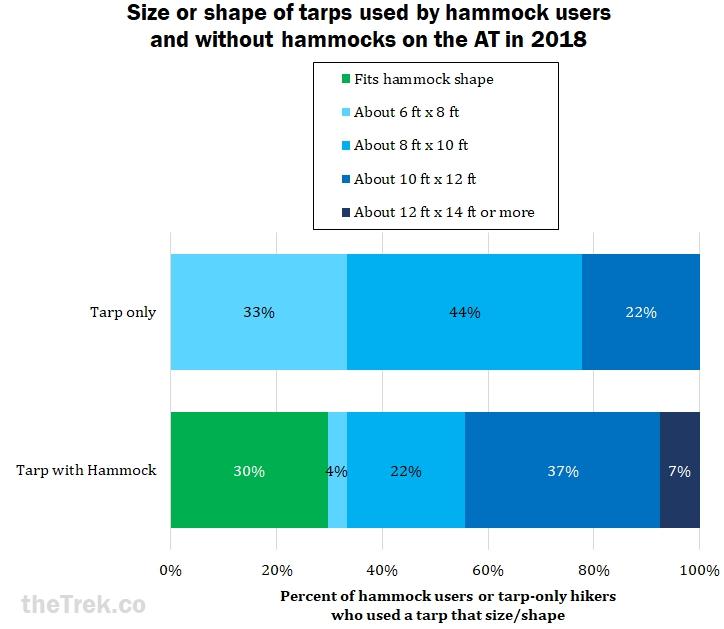 About one third of hammock users preferred a tarp shaped for their hammock. 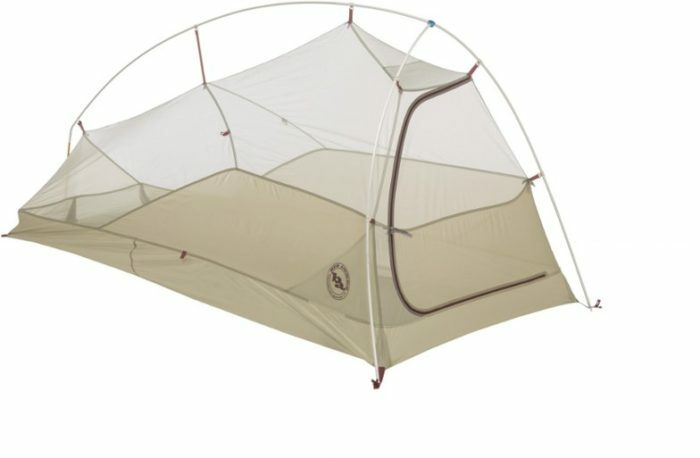 In my experience, a rectangular tarp is more convenient on the AT, even with hammock use, because it can be attached to the front of a lean-to for protection from rain/snow or used on its own if there are no trees nearby. 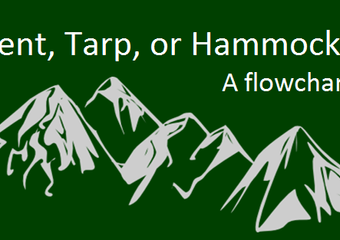 For hikers who used only a tarp, the most common dimensions were 6 by 8 feet or 8 by 10 feet. Because these tarps only need to cover the length of a hiker’s body, not the extended length of a hammock, they don’t have to be as long. If you want to try something different or more lightweight, go with a hammock. All other shelter systems (including no shelter at all), are highly uncommon for long-distance hikes on the AT. 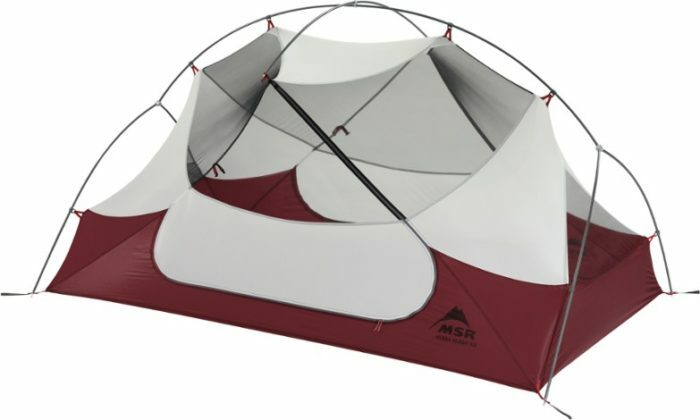 People hiking with a dog or a significant other would likely need a two- or three-person tent. 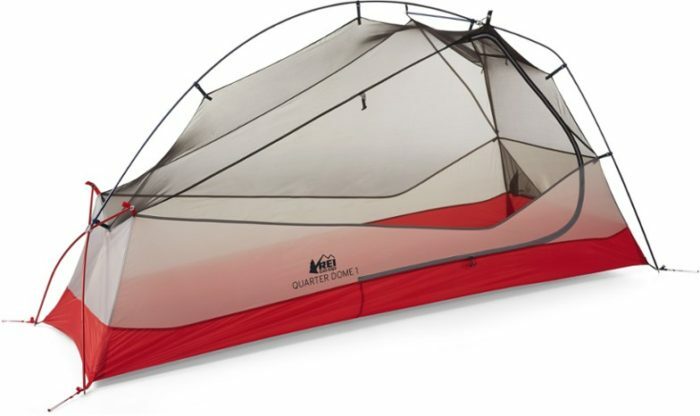 People hiking solo are fine with a one- or two-person tent. If you intend to use a hammock, make sure your tarp is long enough to cover the hammock. 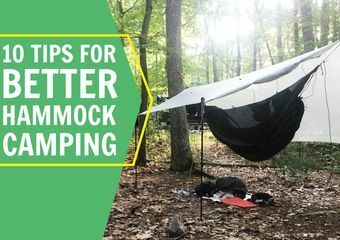 In general a 10 by 12 foot tarp is most popular for hammockers. 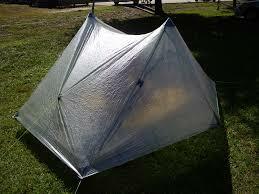 If you intend to use only a tarp, a tarp with dimensions of about 8 by 10 feet is probably sufficient. 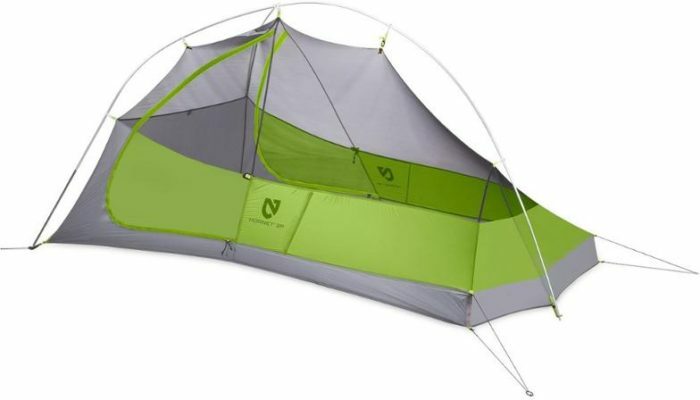 Big Agnes and Z-Packs are by far the most popular brands for tents. 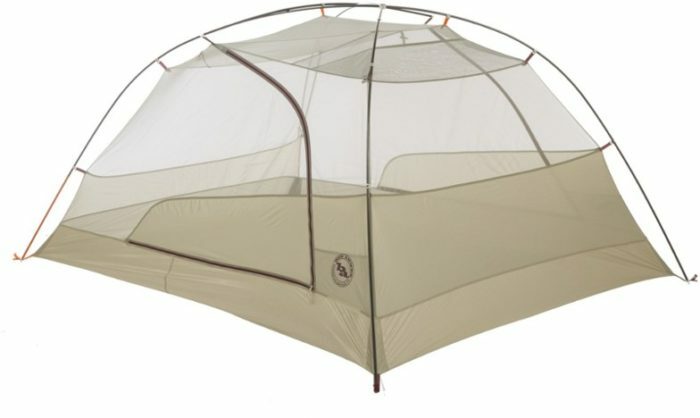 To my knowledge, TarpTent by Henry Shires continues to be one of the only company that makes hybrid models. Hennessy continues to be the most popular hammock brand used by AT long distance hikers. Many thanks to the hikers who participated in the survey! Congratulations to you all and to the dogs who hiked with you! I would never get this data or get these posts done if it weren’t for Zach Davis and Maggie Slepian—thanks to you both. Check out our previous posts with general hiker information and footwear. Subsequent posts will cover sleeping bags and pads, backpacks, and stoves/food/water. 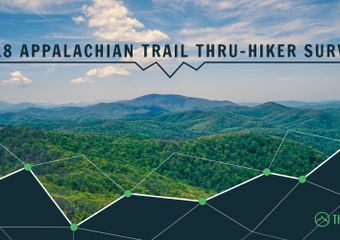 To stay updated on the subsequent hiker survey posts, follow us on Facebook, Twitter, and sign up for the newsletter here. Interesting changes from last year. A 10’x12′ tarp for a hammock is huge. You can great coverage with 11’x8.6′ and save the extra weight. I’d recommend getting one with doors for sure. Glad to see popular tarps on this years list they are a fairly popular choice for the PCT since the weather is a little nicer than the AT. Hennessy hammocks are constructed with sturdy material but they are heavy when compared to other hammocks like Dutchware or Warbonnet. Um, either I’m confused, or your graph (or list) is wrong. 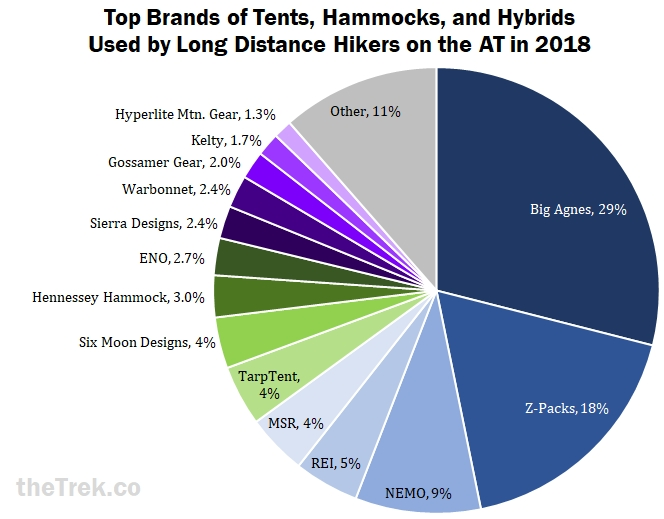 Your list of “Top Tent Brands” doesn’t mention Tarp Tent in it at all, and yet Tarp Tent is tied for the 5th-most popular brand based on the pie chart directly above the list (tied with MSR and Six Moon Designs with 4%). MSR makes your list at #5 and Six Moon Designs makes your list at #6 (Six – very nice, by the way!). Odd. It’s probably just a simple mistake, but I noticed it immediately. ??? It’s interesting how this has changed over the years. In the 1990’s and early 2000’s, the Sierra Designs Clip Flashlight seemed to be the most popular shelter among thru hikers, but the Big Agnes designs have supplanted it now. A tarp for a hammock only needs to cover the persons body? Ummm, no. Those shorter tarps may have been hung in the diagonal. Trust me, a tarp that does not cover the entire hammock results in a wet sleeper. Any chance of that data being collected next time? I’m confused. 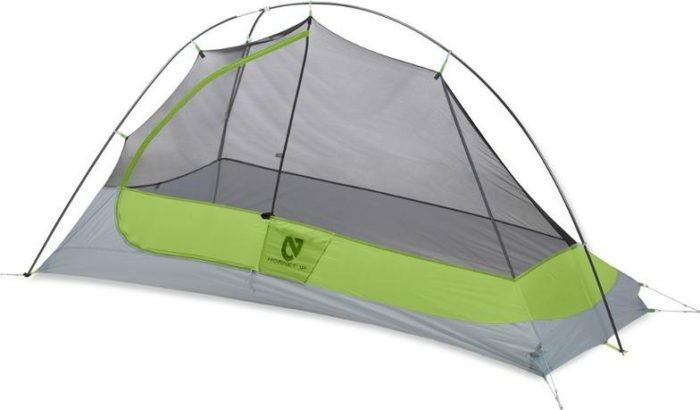 What is the definition of “tent ” and “hybrid?” Zpacks Duplex is listed under tents, yet is a single wall. 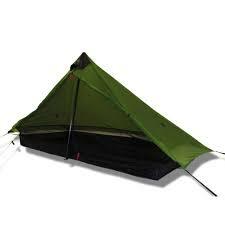 Tarp Tent Rainbow is under hybrid yet is single wall. The Notch is double wall yet is under hybrid. Could someone provide clarification?